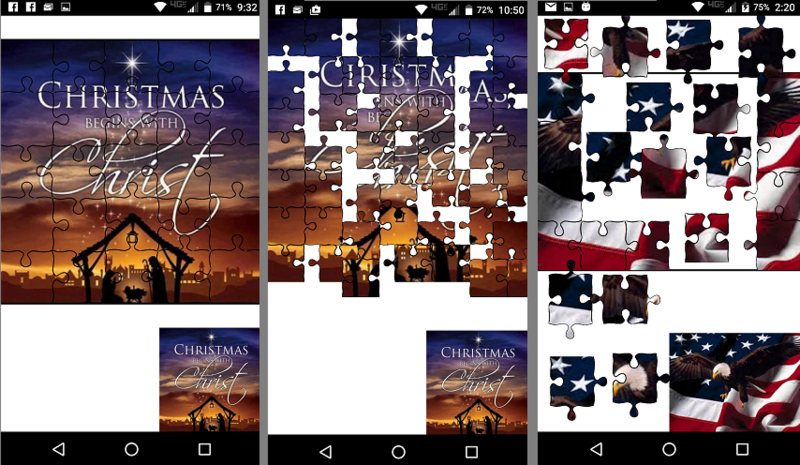 The JigSaw app is a puzzle activity that cuts and scrambles any image into a jigsaw puzzle and can be solved on the device. The images can be selected from images included with the app or selected from the gallery or taken directly from the camera. The puzzle pieces can be cut into any size grid and then solved. Significantly increase the challenge by turning piece rotation on and with the timer feature there is a race against time. A great way to pass the time while traveling or waiting for an event! - Start the puzzle by clicking on the Start buton in the Options menu or Press & Hold on the large image. - Start the puzzle by placing one of the 4 corner pieces and in the work area.